The Eagles slumped to their third league defeat on the bounce on Saturday afternoon, after losing 1-0 at home to Hanwell Town. Bedford were given a blow even before kick off, when an injury during the warm up put paid to top scorer, Tom Liversedge. Russell Bull took his place. Liversedge joined Stuart Smeathers, Ross Oulton and Sam Macrae on the injury list. Danzelle St Louis-Hamilton started his three-match ban, prompting a debut for new signing, George Darlow between the sticks. Last of the missing players was Greg Ling, sitting out his last match before his suspension ended. The match itself was fairly uninspiring. Russell Bull forced a save off Alex Tukarczyk early on, then hit a wonderful shot that dipped a bit too late. At the other end the main protagonist was Jack Hutchinson, who saw a shot go across goal and off, then picked out Bill Healey a little later. 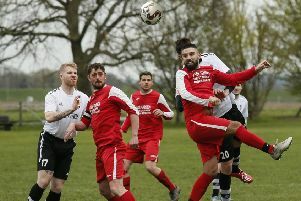 Despite the pass splitting the Bedford defence, allowing Healey sight of goal, the centre forward blazed his shot over the bar, mainly due to a well-timed tackle from Jeff Woodward. Just before the break, Bull was put through, but the attentions of two defenders and the onrushing Tukarczyk gave him no real options, and the resultant stab at goal went just wide of the post. Just seven minutes into the 2nd half, Bedford were given an advantage when Emmanuel Otari fouled Paul Cooper. Booked in the 1st half, Otari was given a second yellow, and his marching orders. Not taking advantage though, the Eagles went behind in the 59th minute courtesy of a bizarre decision. A corner for Hanwell went to the far post and a textbook header from Oliver Duffy prompted George Darlow to push the ball off for another corner. Instead of giving another corner, referee, Mr Ratherham, pointed to the penalty spot much to the bemusement of both sets of players. Bull, near Darlow at the post, was cautioned for a supposed handball. After everything had died down, Michael Buckley stepped up to make sure of the spot kick to give Hanwell the lead. Bedford were unable to break down the ten men, with just a Rob Parker shot to test Tukarczyk. Three minutes before time, Hanwell were down to nine men after Kyle Watson was given a 2nd yellow, but for the remaining minutes it wasn’t enough. Going into stoppage time, Josh Winters’ head across goal was seized upon by Callum Lewis, but his shot hit the post, and any remaining spark of salvaging a point out of the game was extinguished. Bedford stay 18th in the league, and host Biggleswade Town on Tuesday evening in the Beds Senior Cup, at the Eyrie. 7.45pm kick off. Bedford travel to Royston Town on Saturday (January 31) in their next league match. 3pm kick off. Eagles: George Darlow, Paul Cooper, Joe Hopewell, Josh McGoldrick, Jeff Woodward, Ollie Wilkinson [c], Jordan Davis (Josh Winters 65), Callum Lewis, Russell Bull (Kerran Birch 82), Will Summerfield, Rob Parker. Hanwell: Alex Tukarczyk, Emmanuel Otari, Kyle Watson, Ian Bywater, Oliver Duffy, Michael Buckley [c], Connor Duffy, Lewis Ochua, Bill Healey (Eoin Casey 79), Jack Hutchinson (Tom Kennedy 67), Terry Smith (Tom Inch 79). Subs not used: Billy Adcock, Calum Duffy. Assistants: Mr A. Rayment & Mr C. Snuggs.